Sir Joshua Reynolds, the celebrated painter, was, on July 16, 1723, born at Plympton, a small town in Devonshire, England. His father was a minister of the parish, and also master of the grammar school; and being a man of learning and philanthropy, he was beloved and respected by all to whom he was known. Such a man, it will naturally be supposed, was assiduous in the cultivation of the minds of his children, among whom his son Joshua shone conspicuous, by displaying at a very early period a superiority of genius and the rudiments of a correct taste. Unlike other boys, who generally content themselves with giving a literal explanation of their author, regardless of his beauties or his faults, young Reynolds attended to both these, displaying a happy knowledge of what he read, and entering with ardor into the spirit of his author. He discovered likewise talents for composition, and a natural propensity to drawing, in which his friends and intimates thought him qualified to excel. Emulation was a distinguishing characteristic of his mind, which his father perceived with the delight natural to a parent; and designing him for the church, in which he hoped that his talents might raise him to eminence, he sent him to one of the universities. Soon after this period he grew passionately fond of painting; and by the perusal of Richardson's theory of that art was determined to make it his profession through life. At his own earnest request, therefore, he was removed to London; and about the year 1742 became a pupil to Mr. Hudson, who, though not himself an eminent painter, was preceptor to many who afterward excelled in the art. One of the first advices which he gave to Mr. Reynolds was to copy carefully Guercino's drawings. This was done with such skill, that many of the copies are said to be now preserved in the cabinets of the curious as the originals of that very great master. About the year 1749, Mr. Reynolds went to Italy under the auspices, and in the company, of the late Lord (then Commodore) Keppel, who was appointed to the command of the British squadron in the Mediterranean. In this garden of the world, this magic seat of arts, he failed not to visit the schools of the great masters, to study the productions of different ages, and to contemplate with unwearied attention the various beauties which are characteristic of each. His labor here, as has been observed of another painter, was "the labor of love, not the task of the hireling;" and how much he profited by it is known to all Europe. Having remained about two years in Italy, and studied the language as well as the arts of the country with great success, he returned to England, improved by travel and refined by education. On the road to London from the port where he landed, he accidentally found in the inn where he lodged Johnson's life of Savage, and was so taken with the charms of composition, and the masterly delineation of character displayed in that work, that, having begun to read it while leaning his arm on the chimney-piece, he continued in that attitude, insensible of pain till he was hardly able to raise his hand to his head. The admiration of the work naturally led him to seek the acquaintance of its author, who continued one of his sincerest admirers and warmest friends till 1784, when they were separated by the stroke of death. The first thing that distinguished him after his return to his native country was a full-length portrait of Commodore Keppel; which in polite circles was spoken of in terms of the highest encomium, and testified to what a degree of eminence he had arrived in his profession. This was followed by a portrait of Lord Edgecombe, and a few others, which at once introduced him to the first business in portrait-painting; and that branch of the art he cultivated with such success as will forever establish his fame with all descriptions of refined society. Having painted some of the first-rate beauties of the age, the polite world flocked to see the graces and the charms of his pencil; and he soon became the most fashionable painter not only in England, but in all Europe. He has indeed preserved the resemblance of so many illustrious characters, that we feel the less regret at his having left behind him so few historical paintings; though what he has done in that way shows him to have been qualified to excel in both departments. The only landscape, perhaps, which he ever painted, except those beautiful and chaste ones which compose the backgrounds of many of his portraits, is "A View on the Thames from Richmond," which in 1784 was exhibited by the Society for Promoting Painting and Design in Liverpool. 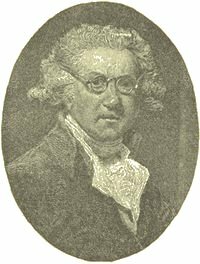 In 1764 Mr. Reynolds had the merit of being the first promoter of that club, which, having long existed without a name, became at last distinguished by the appellation of the Literary Club. Upon the foundation of the Royal Academy of Painting, Sculpture, and Architecture, he was appointed president; and his acknowledged excellence in his profession made the appointment acceptable to all the lovers of art. To add to the dignity of this new institution, his majesty conferred on the president the honor of knighthood; and Sir Joshua delivered his first discourse at the opening of the Academy, on January 2, 1769. The merit of that discourse has been universally admitted among painters; but it contains some directions, respecting the proper mode of prosecuting their studies, to which every student of every art would do well to pay attention. "I would chiefly recommend (says he) that an implicit obedience to the rules of art, as established by the practice of the great masters, should be exacted from the young students. That those models, which have passed through the approbation of ages, should be considered by them as perfect and infallible guides, as subjects for their imitation, not their criticism. I am confident that this is the only efficacious method of making a progress in the arts; and that he who sets out with doubting will find life finished before he becomes master of the rudiments. For it may be laid down as a maxim, that he who begins by presuming on his own sense, has ended his studies as soon as he has commenced them. Every opportunity, therefore, should be taken to discountenance that false and vulgar opinion, that rules are the fetters of genius. They are fetters only to men of no genius; as that armor, which upon the strong becomes an ornament and a defence, upon the weak and misshapen turns into a load, and cripples the body which it was made to protect." Each succeeding year, on the distribution of the prizes, Sir Joshua delivered to the students a discourse of equal merit with this; and perhaps we do not hazard too much when we say, that from the whole collected, the lovers of belles-lettres and the fine arts will acquire juster notions of what is meant by taste in general, and better rules for acquiring a correct taste, than from the multitude of those volumes which have been professedly written on the subject. In the autumn of 1785 he went to Brussels, where he expended about #1,000 on the purchase of paintings which, having been taken from the different monasteries and religious houses in Flanders and Germany, were then exposed to sale by the command of the Emperor Joseph. Gainsborough and he had engaged to paint each other's portrait; and the canvas for both being actually stretched, Sir Joshua gave one sitting to his distinguished rival; but to the regret of every admirer of the art, the unexpected death of the latter prevented all further progress. In 1790 he was anxiously desirous to procure the vacant professorship of perspective in the academy for Mr. Bonomi, an Italian architect; but that artist not having been yet elected an associate, was, of course, no academician, and it became necessary to raise him to those positions, in order to qualify him for being a professor. Mr. Gilpin being his competitor for the associateship, the numbers on the ballot proved equal, when the president, on his casting vote, decided the election in favor of his friend, who was thereby advanced so far toward the professorship. Soon after this, an academic seat being vacant, Sir Joshua exerted all his influence to obtain it for Mr. Bonomi; but finding himself out-voted by a majority of two to one, he quitted the chair with great dissatisfaction, and next day sent to the secretary of the academy a formal resignation of the office, which for twenty-one years he had filled with honor to himself and to his country. His indignation, however, subsiding, he suffered himself to be prevailed upon to return to the chair, which, within a year and a half, he was again desirous to quit for a better reason. Finding a disease of languor, occasioned by an enlargement of the liver, to which he had for some time been subject, increase, and daily expecting a total loss of sight, he wrote a letter to the academy, intimating his intention to resign the office of president on account of bodily infirmities, which disabled him from executing the duties of it to his own satisfaction. The academy received this intelligence with the respectful concern due to the talents and virtues of their president, and either then did enter, or designed to enter, into a resolution honorable to all parties, namely, that a deputation from the whole body of the academy should wait upon him, and inform him of their wish, that the authority and privileges of the office of president might be his during his life, declaring their willingness to permit the performance of any of its duties which might be irksome to him by a deputy. "The hand of Reynolds fell, to rise no more." "His illness was long, but borne with a mild and cheerful fortitude, without the least mixture of anything irritable or querulous, agreeably to the placid and even tenor of his whole life. He had, from the beginning of his malady, a distinct view of his dissolution, which he contemplated with that entire composure which nothing but the innocence, integrity, and usefulness of his life, and an unaffected submission to the will of Providence, could bestow. In this situation he had every consolation from family tenderness, which his tenderness to his family had always merited. "Sir Joshua Reynolds was, on very many accounts, one of the most memorable men of his time; he was the first Englishman who added the praise of the elegant arts to the other glories of his country. In taste, in grace, in facility, in happy invention, and in richness and harmony of coloring, he was equal to the great masters of the renowned ages. In portrait he went beyond them; for he communicated to that branch of the art in which English artists are the most engaged, a variety, a fancy, and a dignity derived from the higher branches, which even those who professed them in a superior manner did not always preserve when they delineated individual nature. His portraits reminded the spectator of the invention of history and the amenity of landscape. In painting portraits he appears not to be raised upon that platform, but to descend to it from a higher sphere. His paintings illustrate his lessons, and his lessons seem to be derived from his paintings.